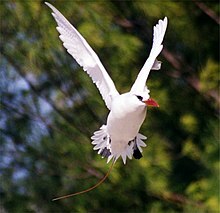 The red-tailed tropicbird, Phaethon rubricauda, is a seabird that nests across the Indian and Pacific Oceans. It is the rarest of the tropicbirds, but is widespread and not considered threatened. It nests in colonies on oceanic islands. This page was last changed on 23 February 2018, at 15:55.